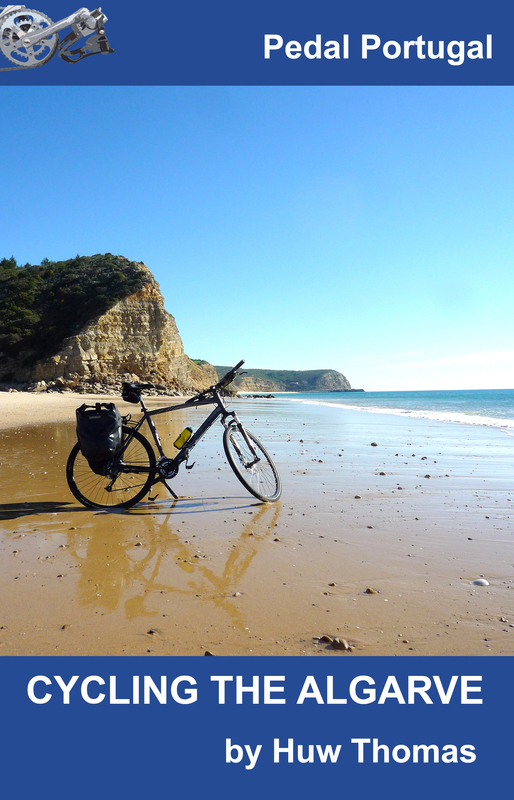 Here at Pedal Portugal we tend to be of the “take everything you need and take your time” school of touring. Our normal target for a day’s riding is 80km – particularly if loaded down with camping gear as well as everything else. But some riders prefer to travel much faster and lighter. Guest blogger Ricky Jackson is a 43-year-old Kiwi who lives in Australia and has previously toured through the French Alps and the Italian Dolomites. 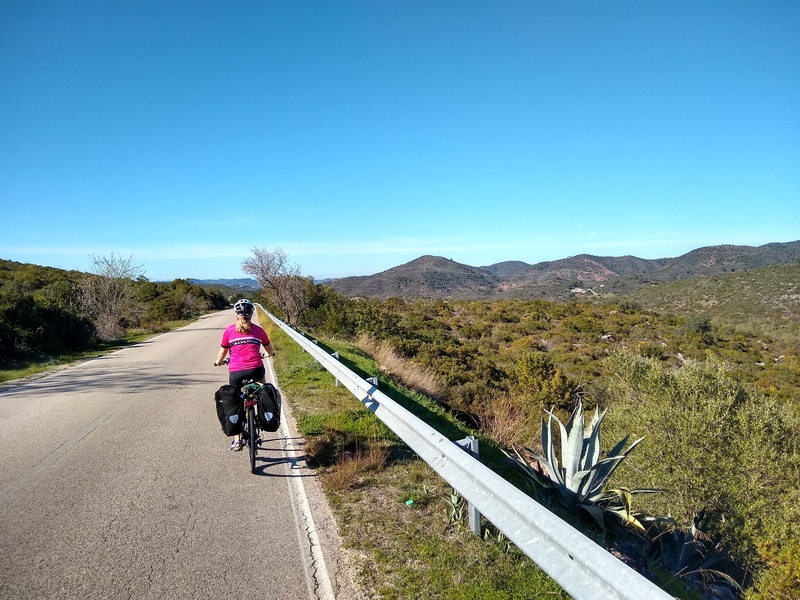 Ricky contacted Pedal Portugal for a bit of route advice earlier this year before tackling a whistle-stop tour of the country as part of a six-and-a-half week trip that also took in the French Pyrenees and Cantabria and Asturias in northern Spain. 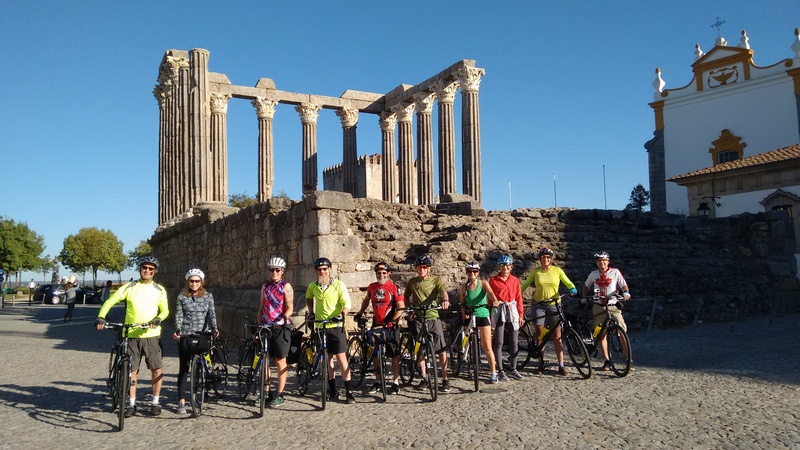 Below is an account of his experiences riding through Portugal – including witnessing the devastation caused by some of this year’s terrible fires. 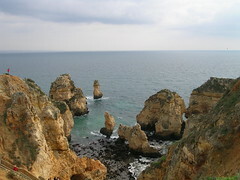 I started my tour of Portugal in Badajoz, Spain. 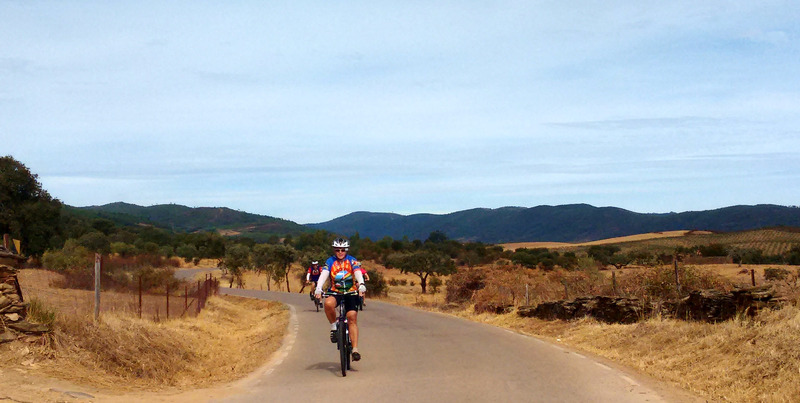 It was Sunday and I set off making a few minor wrong turns trying to find the bicycle route to Elvas. All the grass was dead, all the livestock looked like they had nothing to eat, and no water in any of the rivers. Then I discovered that somehow I had deleted my course off my Garmin mid-ride. I was trying to find the road to the São Mamede lookout. First I realised I had ridden past the correct road so I doubled back. My Garmin showed two possibilities but when I zoom out to see where the roads go there is no map detail. Locals told me the road didn’t go to São Mamede so I descended further only to work out that was the correct road and locals were wrong. I was over it and set a direct course for my hotel arriving at 19.15. My hotel turned out to be the old Castelo de Vide railway station. Ana gave me a laundry bucket and washing powder so I could wash my kit, told me I could cook if I wanted and told me the supermarket 3km away closes at 21.00. I had showered and done my washing when there was a knock on the door. She invited me to dine with her and friends. They fed me a tomato, tuna and olive sauce with pasta and refused a contribution to ingredients. After missing a turn, the Garmin suggested I turn right onto a dirt road. It looked okay and it was only a few kms but then I realised I was zoomed out and it was more like 5km. No turning back and dodging sand and rocks I made it. I started descending to Vila Velha de Rodão when I saw evidence of fires. A forest was burnt and the armco [crash barrier] was deformed and broken. At the bridge over the Rio Tejo I saw where the fire had jumped the massive river and burnt the other side too. Then after climbing out of Vila Velha de Rodão I got to a roundabout where left and right were motorways and straight ahead was partially fenced off. I went around the fence and down about 200m to find workmen and a 4m wide by 3m deep trench across the road. I was so lucky they let me use their temporary stairs to get down and then I found myself walking through a fire ground, dodging burnt stumps about 10cm tall. If I’d had to go back it would have added an extra 11km with around an extra 300m of climbing. In a village just to the north it looked like the fire had burnt up to every house but no houses were burnt. I finally go to my AirB&B place at Aldeia Fundeira [near Pamilhosa da Serra] at 21.30 finding the key under the mat. Tuna pasta again with ingredients I bought en route, and then again for brekky the next day. The climbing was very steep and I was surrounded by wind farms. I finally found food at Piodão after 54km then a very rough descent to Vide and onto the highest mountain in Portugal, Torre in the Serra da Estrela. At the base I had two full water bottles for the 31km climb. By halfway I had drunk nearly all my water and was restricted to mini sips. An infuriating road with stretches of 12% and 15% followed by descents. Finally got to the summit at sunset and found a cheese and souvenir shop. No water but they had coke. On the map the descent to Manteigas shows as a straight line. Not quite but I made it straight in the dark, cutting all the corners. I ate spag bol for dinner making it three days and yet to eat real Portuguese food. I kept heading north to Trevoes. Reaching Gouveia I found the first supermarket I had seen all week and bought bananas, my favourite snack when bike touring. It took me 1hr 20min to get to my original hotel in Pinhão justifying my decision to cancel and rebook the night before. All the hairpin bends on the way down were cobbled. Another big climb to get out of the Douro Valley and onto my hotel in Mondim de Basto via Vila Real and the Alvão natural park. The road out of Vila Real through suburbia was so steep but soon I was in the trees and the gradients eased. Then, when the road was almost flat, disaster struck. I saw the car in front swerve around a rough bit of road. I tried to pick a line through and – bang, bang – two punctures. I fixed the front fine but the rear took two failed attempts before I put my spare tube in. I pumped my tyres up hard and got going again to Mondim de Basto. Finally got wi-fi at a restaurant that night. Next morning I left at 05.30. I should have stayed in bed. In the dark – bang, I hit something. I think it was a small hole. My back rim was caved in opposite the valve, and when I braked it sent massive vibrations through the bike. I started up the Senhora da Graça mountain but after 500m, and finding it very hard, I turned around thinking about the 170km 3000m+ I had to ride/climb the next day. I found a servo [service station] with chairs outside and repumped my tyres as hard as I could and surfed the net till daybreak. I set off again and took a direct route to the second climb of the day. I followed the sign to the motorway. It was a twisty narrow little road with potholes and went up and over two valleys. When I got to Cabeceiras de Basto I found it was a holiday there and bands were playing. I set off on the climb and got 7kms up when I looked at my Garmin and it showed I was in the wrong valley. I consulted my map and it showed Rio Caldo where I just cycled through was also in the wrong valley. I turned around looking for the turnoff I had missed but it wasn’t there to be found. At the bottom I worked out I was on the right road the whole time. Damn Garmin. No way I was going to re-ride 7km of climbing so I set a direct route for Rio Caldo where I was staying. The route went through Vieira do Minho. En route my bike started to turn in more aggressively under braking. The second time I stopped and found my front tyre spongy. I pumped it up again and kept going. At Vieira do Minho I found a bike shop and bought two new tubes replacing the front and keeping a spare. They also took to my back wheel with a pair of pliers to bend the dent back out. The first attempt was too low and put a dent in the rim below the braking surface but subsequent goes pulled the dent out and flattened the braking surface. All fixed – I asked how much and he said nothing. Now I brake and don’t feel anything. At the top of the next hill I stopped for a coke and then started a descent that said Gerês 14km. A long descent down to the lakes and Gerês national park. I got to my hotel around 17.00 having only ridden 80-odd kms but had found a bike shop and taken it easy. Fearing a 14km climb I got up at 04.30 – when my AirB&B host very kindly got up too, to ensure I was well fed. I left at 05.15 and climbed into the mist. It turned out the climb was only 7km and I was up in less than a hour. I only bought my handlebar ay-ups with me and their limitation is that with the shape of my bars the bracket is not centred, and the light aims slightly left. In the dark I missed the first sign for my turn and then the next one. Rather than go back I took a cobbled road to loop back onto my route except it turned to dirt. I only had to walk about 10 metres when I lost traction on a rise. It was only about 1km and now it was light and I was back on track. 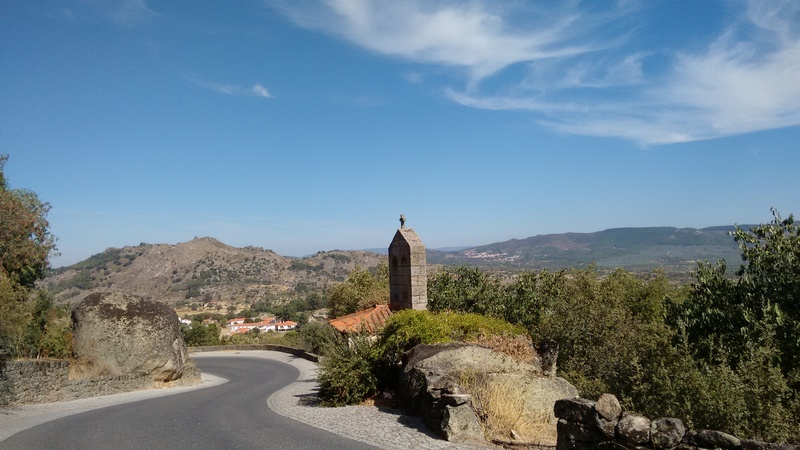 By the time I got to Amarante I had already climbed close to 1,000m and I still had to get into and out of the Douro Valley. I stopped for dinner in Moimenta da Beira and got to my hotel at 21.45. A long day of 177km with 3,563m of climbing. Second to last day I left at 08.00. I knew I had to ride through Guarda and I knew Guarda was the highest city in Portugal but it didn’t prepare me for how hard it was. I was on the old road and it climbed up above the new motorway at challenging gradients. The city is at 1,000m high and there was no real descent until near Sabugal 15km later, then a much bigger drop near Meimoa, then up and around the mountain-top town of Penamacor. There I turned left to head for my hostel in Idanha a Nova. The sun was setting and as I got to Proença-a-Velha my Garmin said the road finished, but in reality it turned to cobbles. I have had to ride through so many villages in Portugal with cobblestone roads. As I entered the square a small dog ran up and bit my foot through my shoe while my foot was clipped in. I got revenge by riding into the dog when it turned to run away. Next morning I set off for my final ride. I discovered Idanha-a-Nova is perched on a cliff on the edge of a plateau and enjoyed a fast descent upon leaving. I made it to the border of Spain through Segura OK and then all the hills started. You could see the road rolling as far as the eye could see. I stopped to take photos and read the blurb on an ancient Roman bridge over the Rio Tejo. Upon leaving I chose the dirt verge over more cobbles and got about 700m up the hill to Alcántara when I could feel the valve hitting the road. Replaced the tube removing a plant piece that had penetrated the tyre. After this my energy and motivation were sapped. Leaving Alcántara at 15.30 (Portugal was 1hr behind) I made it to Alburquerque just before 20.00. Faced with being able to ride further in daylight but not have dinner I chose dinner and riding in the dark. Being an hour behind, Portugal got dark at 19.00 every night but also got lighter earlier. I didn’t see any evidence of bushfire this day making this day and the first day the only days with no burnt trees. I made it back to Badajoz and my bike suitcase at 23.30. A total of 1,478.28km climbing 22,957m. Thinking about other self-supported cyclists I met on this trip, I met a couple from Slovenia at Pinhão, three from the Netherlands at Vide and on the last day a Spaniard near Brozas. None were on racers like me and all were loaded up with panniers and carriers etc. All commented on how little stuff I carry. One of the Dutch guys was even carrying a laptop! I saw some interesting looking houses in Portugal. I saw cladding that looked like Lego bricks, tiling on outside walls that look like bathrooms with small tiles and stone houses painted pastel colours and pure white. I had a few scares with a dog running out onto the road on a blind bend and encountered a group of people standing on one half of the road when someone just turned and stepped in front of me. Drivers in Portugal are OK in the mountains but in the cities they come close, just like at home in Adelaide, Australia. Food and drinks were cheap in Portugal but there were no bananas outside the big towns/cities. Having toured through the French Alps and Pyrennes, the Dolomites, and the Cantabria and Asturia regions in Spain, I would rate Portugal as having the steepest roads overall. Overall, I only had a few spots with cool mornings and glorious sunny days. Portugal is a great place to visit and when I come back I will head straight to the Gerês park to properly explore the area. https://ridewithgps.com/routes/26574877 ( a summary of my route less the detours to my nightly lodgings) . The other missing km’s are the the 265km round trip I had to ride to recover my camera that I had left in someones car, Not what I should have been doing the day before such a grueling trip!